A 67-page report was released on Thursday by the NCAA Committee of Infractions detailing the severity of the violations incurred by the University of Southern California. The NCAA has ruled that USC broke a wide array of rules in their football, men's basketball, and women's tennis programs from 2004-2009. 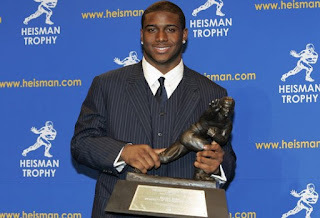 The violations were majorily centered on Heisman-winning running back and current New Orleans Saints football player Reggie Bush (pictured below), basketball star O.J. Mayo, and women's tennis player Gabriela Niculescu. There were 18 violations cited relating to Bush and his behavior while attending USC. Among them were accepting cash payments, airfare and hotel compensations, limo service, a car for Bush and a house for his parents, among others. There were 12 violations cited for Mayo, naming similar things. The NCAA partly blames these occurrences on USC's negligence and lack of oversight into their athletic programs. A vacation of all football victories from December 2004 through the entire 2005 season, including their 2005 national championship win against Oklahoma. Any person involved in these USC sanctions has the opportunity to appeal them to the NCAA Infractions Appeals Committee. 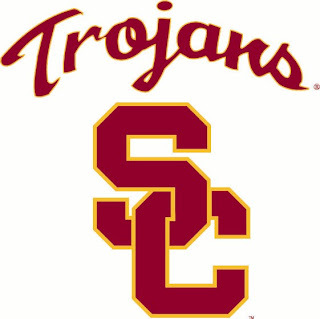 USC plans to accept the sanctions imposed by the NCAA that are similar to those imposed on other teams that have broken similar rules, but plans to appeal the ones that they believe to be too harsh. Personally, I think the sanctions were made too harshly on purpose. The NCAA is making an example out of a top-ranked athletic program to show that even the best fall and cannot get away with anything. It will take months and months to go through an appeals process, and I think that very few, if any of the sanctions will be removed. I don't see how this couldn't severely affect both the football and basketball programs at USC, but I suppose that has yet to be seen. Any wonder why the Pac-10 was the first to make a move in this conference-jenga that's starting? It's no coincidence that they offered Colorado a spot in the soon-to-be Pac-16 the same day that USC sanctions were made public. Sorry to the six teams that are about to join the Pac-10, but this isn't about you. It's about USC and you're just along for the Trojan-horse ride.